For many companies, the Financial Closing or ‘Closing the Books’ process is a very time consuming and tedious process. The Financial Close consists of recording, consolidating, verifying, analyzing and finally reporting the organization’s financial results to internal and/or external audiences. Soltec has found that many organizations spend the majority of their time and effort in the Financial Close process on non-value added tasks such as manual entries, consolidations and calculations with little time spent analyzing the financial results. 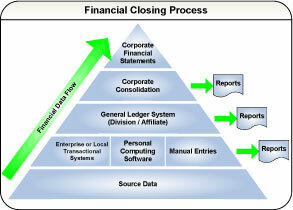 Soltec’s Financial Closing Best Practice Solution provides organizations with a complete package that eliminates non-value added tasks and ensures a shorter and more efficient closing process that allows more time for the analysis and review of strategic financial activities, including historical pattern, trend and problem detection. After the implementation of Soltec’s Financial Closing Best Practices, the effort and cost to close the company’s books are significantly reduced.